Last year at this time, Product Hunt didn’t exist. Its founder, Ryan Hoover, was the Director of Product at gaming company PlayHaven and an active blogger, attracting a loyal but modest following. He couldn’t have anticipated what was to come. Kicked off in November 2013, Product Hunt has seen rapid hockey-stick growth. It’s become a known quantity in the media and among influencers. And the company just announced that it's part of Y Combinator’s current class of startup starlets. Suddenly, Hoover has found himself a tastemaker with a very high-powered audience. Product Hunt is now the place to discover the“next big things” in tech. Every day, it curates a list of the top products and startups that people haven’t heard of yet and lets a widening yet select group of members upvote, comment and discuss. The result is a daily top 10 list of what people should be paying attention to across the industry. Founders are using it as a launch pad, investors as a hunting ground, and many others just to stay in the know. Product Hunt may have started as an experimental side project, but in many ways its rise was keenly manufactured. In this exclusive interview, Hoover shares the tactics startups can use to capture attention early and build on it for success. Articulate a clear gap in the market. The idea for Product Hunt surfaced when Hoover realized how much time he was spending talking about new tech products and gadgets with friends. A lot of people would ask him what he thought of new things on TechCrunch, Hacker News, Reddit and Twitter. There seemed to be many places to go to find this type of information — too many places. “What there wasn’t was one platform-agnostic destination for all of it,” he says. He started thinking through prospective competitors for this type of platform. "I looked at things like Kickstarter, but that site was limited to products running crowdfunding campaigns, and others had other limitations. I wanted some sort of curation — a way to find all of the cool new things that the startup community would find interesting. There was no one place for these types of conversations." Initially, Product Hunt was shaped by what it wasn’t. It wasn’t part of a broader tech community. It wasn’t too technical. It wasn’t too consumer. It wasn’t overrun by commentary or fragmented across multiple sites. It was one, clear, simple list that would allow people to skim through or dig deeper as they wished. It was a niche that many might have overlooked. But Hoover was able to explain why this niche was compelling for busy people who wanted to get all the information they needed in one place. With this explanation in hand, Hoover set out to test whether others would embrace this type of resource. He chose email to run this test, partially because it was easy to execute (thanks to link-sharing tool Linkydink), but also because it had the potential to snowball fast. Email gave Hoover’s initial followers the ability to forward Product Hunt messages on to other potential subscribers, and create a network through the most resonant form of communication. People pay much closer attention to their inboxes (especially when emails come from people they know) than to social media or other marketing efforts, no matter how well designed. A recent McKinsey study declared emails to be 40 times more effective at customer acquisition than Facebook and Twitter combined. So, if you’re gauging interest in what your startup has to offer, email gives you the chance to watch organic growth, experiment easily with small tweaks, and build an audience from scratch. “Even though the email was super basic, it gave me validation that people cared about this content,” says Hoover. And when he eventually decided to build the site, the email list became the most important asset and springboard for driving traffic and keeping people coming back again and again. It’s continued to swell as Product Hunt has gained momentum, a constant source of new fans and marketing opportunities. Give people a new habit. When the Product Hunt site launched earlier this year, one of the smartest decisions Hoover and his co-creators made was to “day part” the listing of products. Every day starts fresh with new product submissions, votes and comments. Past days can be viewed —conflated to the top 10 items with the most votes —as infinite-scrolling time capsules of products. You can see what people loved last week, three months ago, etc. But to see what people love today, you have to come back to the site. “Segmenting the service by day has been critical — we’re building this daily ritual for people,” says Hoover. “By time bounding what we’re doing, we frame Product Hunt as something that people set time aside to do each day.” This is the pattern of usage he’s observed as the site has gained more visitors. Just like people return to a favorite blog or people they follow on Twitter, they see what’s up on Product Hunt — a mentality Hoover and the team were able to establish fresh out of the gate. 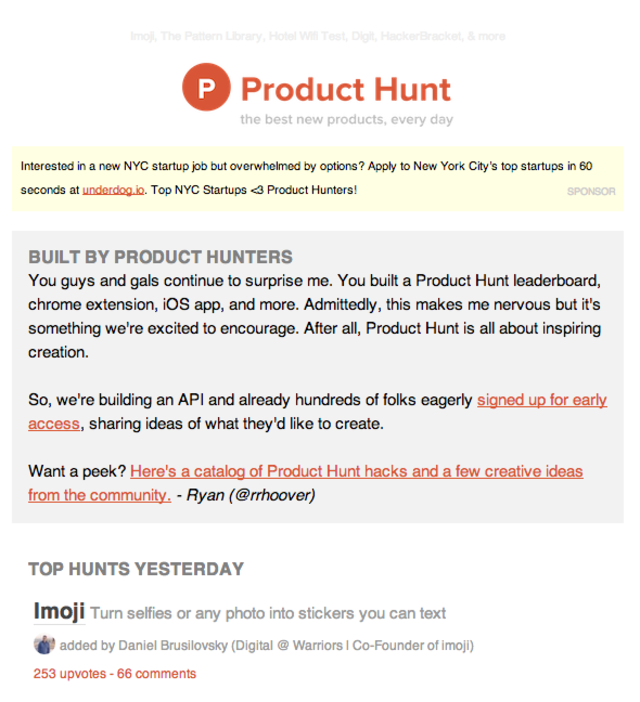 Email has also been instrumental in reinforcing the Product Hunt habit. Subscribers receive a daily email summarizing the top products from the previous day and sharing any other relevant information about the site. For example, Hoover has been able to launch a podcast series drawing big names like Reddit’s Alexis Ohanian, Kevin Rose, and Robert Scoble — and has effectively driven eyes and ears to it using email. “They don’t send emails. They don’t send push notifications,” Hoover says of many founders and makers. “At the end of the day, if users like your product, they will want to be reminded about it. That’s how we get people who have maybe just visited once or twice to make it a ritual. We prompted them. Email is the best way to get people to reengage.” So far so good, the Product Hunt team has been seeing open and clickthrough rates that roundly beat industry averages. Don’t distract from your primary goal. Something that is very unique to Product Hunt is that it doesn’t give users a bunch of options to share content on their social channels. You have the option to tweet a new product, and that’s pretty much it — and even that is fundamental to the site because users log in using their Twitter identities. Choices are limited. As a visitor, you can click through to see products, and if logged in, you can upvote or comment. It comes back to the question of what makes something sharable. In most cases, people want to share or “hunt” a product on the site in order to look smart, savvy, connected. They want to comment to build intellectual credibility and a point of view among other influencers. One of the reasons Product Hunt has taken off is that so many of its users have communities that listen to them. In particular, Hoover has found it especially valuable to involve the makers or founders behind the products on the site in dialogue. Users love to hear the rationale behind different features, and relish the opportunity to discuss things with them directly. It’s a rare opportunity. He supplemented this communication by constantly monitoring comment threads on the site, chiming in with thoughtful responses to individuals, congratulating them on helpful insights, and encouraging them to stay involved in conversations. This consumed hours of his time, but has made a big difference. To get the site’s influencers even more embedded in Product Hunt, he has given them opportunities to literally shape the look, feel and functionality of the site. Using Invision to share mockups for both the web and iOS app versions of Product Hunt, he asked his most influential followers to provide their input on everything from the tagline to page structure to navigation. Critical to the success of this strategy was actually delivering something based on user feedback in a timely manner. Hoover worked with his friend Nathan Bashaw to build the first site over a four-day weekend. And even though it was somewhat buggy to start, the influencers who had spent time giving their opinions had the ability to play with something right away. According to Hoover, this cemented many people’s loyalty to the site. People attend these events knowing ahead of time that they are likely to meet other people who could be valuable networking contacts. They provide another touchpoint for people who have already been submitting products and commenting to really get to know one another and maybe help each other professionally in other ways. The more people with large networks who love the product, the more people they will bring into the fold, and the faster Product Hunt will grow. Hoover has already seen this ripple effect take place, and hopes to maximize it even more by hosting hackathons and making it easier for like-minded influencers to find and connect with one another. Recently, he doled out invites to some of the more engaged members of the Product Hunt community that would grant people commenting and voting privileges. The way the invites worked required these individuals to tweet to their invitees. Given their larger than average followings, they not only invited people, but intrigued many more about Product Hunt and potentially becoming a member. Limit access and gradually expand. Since the site launched, only a certain number of people have been able to exercise all of its functionality — and many were handpicked by Hoover. This has cultivated a sense of exclusivity that incentivized influencers to be even more excited about joining the site. But this wasn’t the only reasoning. It’s been said that it’s important for startups to explore ideas that aren’t scalable. Product Hunt is proof that it’s sometimes beneficial to restrict scaling entirely. It can give you a chance to put more things about your site, product or experience in stone. It can give you a sandbox where it’s safer to play before opening things up to a broader audience. And, perhaps most importantly, it can elevate the quality of content at the very start so that you can make a great first impression on everyone who visits the site. Hoover knows that they will inevitably need to grow to accommodate new users. When this happens, he expects to implement some of the more sophisticated tactics used by Hacker News and Reddit to make sure the best content bubbles up to the top. “We fully expect to put measures in place to prevent spamming and use ranking algorithms to manage curation." Limiting the size of the community around your service or product can sound counterintuitive, but it does come with a lot of pluses. Once you’ve attracted the right people who can get you even more users, you want to make sure they have positive experiences — and the best way to do that is often to be more intentional and involved in shaping interactions. Don’t wait on your product before building an audience. In Hoover’s case, he ran his blog for nearly two years before Product Hunt burst onto the scene. He wrote about a range of topics relevant to those working for startups in areas like product design, marketing, and product management. He also helpedNir Eyalwrite his book,Hooked: How to Build Habit-Forming Products. The fanbase he built around this blog helped him seed the initial group that got access to Product Hunt, and it made a huge impact at the very beginning.